Longtime member but mostly lurker here. Like many here, I’m no stranger to the Orlando area theme parks, but man cannot live on the combination of butterbeer and turkey legs alone. Nay, it’s time to set foot on the distant shores of a land so iconic that Drew Carey calls out its name at the end of his sitcom’s opening theme. O-hi-o, bay bay! Yes after 16 years of basically sitting on my hands about it, I’m going (along with my girlfriend and two of my cousins) to Ohio for the first time on the last week of June (23-30) in order to visit Cedar Point and Kings Island. Presently the itinerary for the trip is as follows: Saturday, June 23 - fly into Cincinnati International/open day in Cincy; Sunday, June 24 - open day in Cincy; Monday, June 25 - Kings Island; Tuesday, June 26 - travel day to Sandusky/open day; Wednesday, June 27 and Thursday, June 28 - Cedar Point; Friday, June 29 - travel day back to Cincy/open day; and Saturday, June 30 - fly back home. Now if you’re wondering about all the open days, I have them for three reasons: one, the same two cousins and I did a big Orlando trip last year (a park per day at Universal Studios, Islands, Magic Kingdom, Animal Kingdom, DHS, SeaWorld, and Busch Gardens) since they hadn’t been to Orlando in about fifteen years. I know they couldn’t handle some running and gunning like that again, so I figured it would make traveling easier. Two, I’d like to see some sights and do some non amusement park related things. And three, I’d like to have some flexibility in case the weather put us in some sort of bind for whatever reason. I’m not so much worried about temperature (I’m from central Mississippi, so anything in the summer that doesn’t feel like straight death might as well be paradise to me). What I am curious about is the frequency and intensity of stormy weather and rain? Are we talking like your daily, quick summer thunderstorm? Or an if rain comes in, it stays in type situation? Or is it all just luck of the draw? How are the crowds in June? I’d assume the crowds start to pick up as June rolls along, but even in the latter part of June, it’s more of a normal busy (60-90 min waits for the most popular or lowest capacity of the big coasters, 30-45 min for the high capacity or mid range popular coasters). Or am I totally off base? Another question I have is what are the waits usually like for the non coaster thrill rides and flat rides? From what I’ve gathered looking at some of the past discussion posts on using FLP at Cedar Point is that it’s really only absolutely necessary under certain conditions: going for one day; going on a Saturday; and/or getting multiple rides out of all of the coasters. Plus it’s best to wait and see on the day of the trip if you actually need it. Is that still the consensus? Also would most of that criteria apply to Kings Island as well? For Cedar Point, I’ve seen a lot of people say to try to hit Maverick, Millenium Force, and TTD (if it’s up and running) early seeing as they usually have some of the longest waits throughout the day, and after that, it’s best to just pick a spot and start riding things as you come up to them since Cedar Point has a lot of ground to cover. Is that still the best plan of action, or should we bum rush Steel Vengeance like we have nothing to lose? For Kings Island, I’ve seen some people say that they like to start with Firehawk and Flight of Fear seeing as how their capacities usually make for longer lines. From those two, should we make our way over to Mystic Timbers and Diamondback or head in the opposite direction over to Banshee? Or is there a better starting point for the day? Finally whether it’s in Cincinnati, Sandusky, or somewhere in between, I’m looking for any kind of recommendations for things to do on our open days. Now I don’t think we’ll have a hard time finding things to do, and I do have some things in mind already, such as the Cincinnati Zoo (which was the first thing that came to mind) and the Cincinnati Museum Center (depending on what of it is open because of the Union Terminal restoration). Like I said, I am open to any suggestions, no matter how niche. A big, hearty thanks to anyone who takes the time to read any of this and indulge me while I’m being so extra. I really appreciate it. Weather - Cincy weather can be rather delightful in June, but don't be surprised if there's some humidity and a chance for afternoon thunderstorms. Sandusky is a little more unpredictable being on Lake Erie. It could be gorgeous one moment and then 30 minutes later it could be cold, windy, and pouring down rain. There's really no way to project the weather this far ahead, but I would say that you're picking the best of the 3 summer months to go, weather-wise. King's Island - I haven't been to KI since the year before Mystic Timbers opened, but it's a pretty easy park to visit. Going on a weekday will help to lessen the crowds, and there don't appear to be any special events in the park planned the week you'll be there. I don't know what coasters you've ridden before, but a few of the KI coasters are clones of coasters that you can ride at other parks, so I tend to value those lower in my priority when touring the park. Given typical coaster throughoutput, popularity, and re-ridability, I would tour the park counter clockwise starting at Mystic Timbers, following with Diamondback, Beast, Vortex, Backlot Stunt Coaster, Flight of Fear and Firehawk (if you care about those 2, I typically skip those because they're in an isolated area and are both mediocre, slow loading, cloned coasters), Racer, Adventure Express, Banshee, Bat, and Invertigo (if you really care about Vekoma inverted boomerangs). I typically hit a few of the flat rides as I walk around too, and will make a second lap around for re-rides and to pick up any flat rides I missed on the first loop. For my money, Banshee is probably the best coaster in the park, so if not for Mystic Timbers, I would start to the left and progress around the park clockwise, but from what I've heard, Mystic Timbers does not have the throughput that Banshee does, and going counterclockwise puts you at Beast earlier in the day, which always tends to have a line because they're typically only running 2 trains on a coaster that is over 3 minutes long (compare that to Banshee which runs 3 trains on a course that takes about 90 second to traverse, including the lift hill). I don't know if you have a platinum pass (might be a good investment if you're going to spend 3-4 days across the 2 Ohio parks), but if you do, they offer ERT in the mornings for certain rides, which changes from day to day (last time we were there, they had Diamondback, Banshee, and Beast). If you don't have a pass, you still might want to show up early, but pay attention to what rides they are giving ERT on, and avoid those during the first hour of regular operation since they'll already have queues full of passholders. Unlike Cedar Point, Kings Island has a nice circular design that limits walking, but it's still a HUGE park, and so I highly recommend riding attractions as you get to them. They've done a good job spreading the best attractions around the park, so you want to avoid trying to go back and forth across the park. Also, don't forget to carve out some time for a show - they haven't announced one yet, but the main indoor theater usually houses a cirque-style, stunt show, or magic show that can offer a nice break if the weather gets bad or just a spot to take a 30-45 minute rest. FastLane - Going on weekdays, I think you can get away without having to buy FastLane at both parks. Also, you'd probably need to get Fastlane Plus to limit line waiting for the best rides at each park, which is typically more than the price of a single day admission. If you only had 1 day at Cedar Point, I'd probably recommend FastLane Plus there, but with 2 days, you can save your money and use that for food or souvenirs. Other points of interest - We've been taking trips to Ohio since I was a wee lad (my mom's side of the family lives in eastern Ohio - about 30 minutes outside of Pittsburgh), but I still feel like I haven't explored everything in the state. We always plan our theme park trips around baseball too, and if you're into MLB, the Reds are in town the first weekend you're in Cincinnati (against the Cubs). The Reds are also back in town when you come back to Cincy to fly home (against the Brewers). If sports aren't your thing, there's the National Museum of the USAF in Dayton, which is a place I've been meaning to visit for a long time, but it never fits into our schedule. There are also tons of attractions in Columbus, which you'll drive through on your way between Cincy and Sandusky. If you're going to go to a zoo, I'd highly recommend the Columbus Zoo - Jack Hanna's Zoo (or Akron Zoo - I have a relative who works there) over the Cincinnati Zoo - really only famous because of Harambe. Closer to Sandusky, we've been pairing a trip to Cedar Point with the Pro Football Hall of Fame induction weekend in Canton (also happens to usually line up with my family reunion). There are also tons of great attractions in Cleveland (about 60 minutes east of Sandusky), which has become a much more tourist friendly city than it was just a decade ago. I'm not sure what your interests are (museums, sports, industry, natural wonders, etc...), so I can probably give more specific points of interest outside of the theme parks with a little more information about you. If you have or end up buying Cedar Fair passes, you can always spend time at the Soak City water parks too. Ah, thanks for all of the great info, Russell. I really appreciate it! As far as the weather goes, that’s what I was hoping to hear in regards to Cincinnati and halfway what I was expecting in regards to Sandusky. Hopefully we’ll have some gorgeous, mild days without any northern Ohio monsoons. Now full disclosure: I’ve never been to any of the current Cedar Fair parks. I have ridden some similar coasters to what is offered at KI and CP (Cheetah Hunt for Maverick, Mako for Diamondback, Montu for Banshee or Raptor, etc), but some style of rides will be completely new to me (Millenium Force, TTD, Steel Vengeance). I do have my “must rides,” but I’m up for any ride though as long as it doesn’t feel like I’m going ten rounds with Jake LaMotta. I do like your advice for KI because that will hit three of my high priorities (Mystic Timbers, Diamondback, and Beast) early on, and I do care more about them than FoF or Firehawk. Regarding a CP strategy, you also bring up a lot of great points as no one really knows for sure what operations and queuing will be like for SV. I know how crazy a great, new ride can be in Orlando at first (Flight of Passage springs to mind), but I didn’t know if it gets similarly crazy at CP. Your coaster priority list is about the same as mine as well. This may seem like a dumb question, but when parking in the back lot, is there a special entrance to get back there? Or do you just go through the main lot and around the peninsula? I haven’t bought tickets yet, but I’m glad you brought up the Platinum Pass because I have been mulling it over. Although it would be a little more expensive than the alternative (two day CP and single day KI), it’s still very reasonably priced. Plus with added perks of admission to any Cedar Fair Park, some extra flexibility in case we wanted to spend more time at the parks, free parking, ERT, free Dinosaurs Alive (my girlfriend really wants to see the animatronic dinosaurs) and automatic upgrades to FLP if you buy FL, it looks a lot more attractive. Just so you know, KI’s website says it’ll be doing ERT for Mystic Timbers, Banshee, Bat, and select Planet Snoopy rides from April-June. Now with the other points of interest. I think most of the party isn’t really into sports (one of my cousins is, but I don’t know how big of a baseball fan he is). I’m neutral on sports (don’t follow them but will watch them), but I’d go to a game especially since I’ve never been to a Major League game before. We are all museum people though, and the suggestion for National Museum of the USAF is definitely right up our alley (I don’t know if you’ve ever been to Pensacola, Florida, but they have the National Naval Aviation Museum on their base. I liked it a lot.) Pretty much any kind of historical or science/technological museum or tour is good with me. I’ll also have to keep the Columbus Zoo in mind over the Cincinnati Zoo. As Russell mentioned, James K is pretty much the authority here on Ohio parks, so if he posts anything contradictory to the below I'd absolutely recommend taking his advice. However, here's what I'd say based on my visits to the parks (both of which were most recently visited in 2014). Weather: In my experience, Cedar Point is all over the place. It can go from sunny to cloudy to sunny to thunderstorm to back to sunny in a couple hours. Expect to get rained on at least once while you're at the park, but know that it will usually be a short rain storm rather than a full day onslaught. The park tends to close most of their big rides for the duration of the rain, but they will reopen (often with shorter lines) once the storm has passed. Weather isn't as much of an issue in Cincinnati, though it can have heat and humidity. Note that my previous visits have been in July and August, so June may be a bit milder. Crowds: Cedar Point is a very popular park with a relatively short operating season, and as a result it sees huge crowds. Fortunately, operations at the park are better than any park not named Disney, so the lines move constantly and look more daunting than they may actually. For a weekday, expect waits of 40-60 minutes for the top tier coasters, with waits of 20-30 minutes for second tier coasters and major non-coaster rides. Smaller flat rides and lesser coasters may have no wait at all. There are two notable exceptions: Maverick, which is almost always over an hour wait due to capacity, and Steel Vengeance, which very likely will be 2+ hours every operating day this year. Fast Lane: If you have two weekdays at Cedar Point, Fast Lane is not necessary unless you want to get a lot of re-rides. While it does not grant immediate access, it will reduce your wait times on most coasters to 15 minutes or less. That said, it will make your day a lot more enjoyable as Cedar Point's queues are mostly unthemed switchbacks. If your budget permits, it's well worth purchasing Fast Lane for one day to enjoy as many coasters as you can. Definitely don't purchase it ahead of time, as you could get really lucky with a dead day, but try to decide within an hour or two of opening if it would be a good idea to maximize value. Touring Strategy: If you have access to early entry (either by staying on property or by owning a Platinum pass), arrive at the park at least 20 minutes before it starts. I recommend using the gate by Magnum, as it is usually less busy (just drive around the peninsula and park in the Soak City lot) and is conveniently located for Frontiertown and the Gemini Midway. Once inside, head directly to Steel Vengeance and Maverick, and try to get 1-2 rides on each before the park opens to all. If you're up for it, I recommend focusing on just coasters for your first day at the park. On your second day, hit the coasters you missed (if any...though difficult, it's possible to do all 15 in one day), re-ride your favorites, and tackle the non-coasters that interest you most (the don't miss rides in this category are the Cedar Downs Racing Derby, MaXair, Power Tower, Skyhawk, and Windseeker). Crowds: While not as busy as Cedar Point, Kings Island's operations and ride capacity aren't quite as good, so I'd expect similar with lines (40-60 minutes for top tier coasters, 20-30 minutes for second tier coasters and major non-coaster attractions). The park is smaller than Cedar Point so the crowd doesn't spread out as much, but it still has enough attractions to handle everyone. Fast Lane: If you only have one day at the park and want to be certain you won't miss anything, Fast Lane would be a wise investment. While it's possible to do everything in a day without it, you'll have a very busy day with little downtime. Ideally, I'd recommend modifying your schedule to allow a day and a half at Kings Island (particularly if you purchase a Platinum Pass), which would allow you to do everything easily without Fast Lane. Option A: Start with Mystic Timbers, then do Beast and Diamondback as soon as the park opens for the day. From here, head to X-Base for Firehawk and Flight of Fear. Option B: Start with Bat and Banshee, then head to X-Base as soon as the park opens for Firehawk and Flight of Fear. This will result in a much shorter wait for Firehawk, but that may be countered by longer lines at Beast and Mystic Timbers later (particularly if either coaster is not running three trains). For non-coaster attractions, do not miss Boo Blasters and Drop Tower. Delirium and Windseeker are the other top flats, but both have copies at Cedar Point, so you can skip them here if time is critical. Unfortunately, I don't have much in the way of non-park suggestions, but I know there is plenty to do the Cincinnati and Columbus areas (not as much in the Sandusky area, other than Lake Erie and Cedar Point). Others who have spent more time in the cities would be of more help here. Lastly, a note in case you want to tweak your schedule: I'm planning a trip to Ohio myself with a group of friends (both fellow TPI members and outsiders), and the dates are quite similar to yours. We will be at Cedar Point on June 25th and 26th, then Kings Island on June 27th. If you end up visiting the parks on those dates and would like to meet up for a ride or two, be sure to let me know. I'm sure you'll have a great time! Cedar Point and Kings Island are among the best regional parks in the country (I actually prefer the former to many destination parks), and are places every enthusiast needs to visit at least once. As the veteran of a disastrous trip to Kings Island some years ago - during which I got to ride only 2 roller coasters due to the park's being impossibly crowded - I have become a strong advocate of FastLane Plus. Going back to Kings Island this weekend and with FastLane Plus expect to have a great visit. As to Cedar Point, it's been extremely crowded every time I visited - despite the fact that the last time I visited it was a weekday, cold and damp. On my 1st visit I had to wait 2 1/2 hrs. for Millennium Force. Never again. I'd just about written this park off but with Steel Vengeance about to open I am going back and going to bloody well buy FastLane Plus. Thank you so much, AJ and Bobbie! You are all making my life a lot easier. Like I said before, I live in Mississippi, so some heat and humidity won’t be too much of a bother. The Orlando trip last year was the first time I had been down there in the summer since the Wizarding World: Hogsmeade first opened at IOA (we went the last week of August, and I’ve usually been going in the fall or winter post-college). It was a great trip, but the heat was the worst. Antarctica: Empire of the Penguin practically became my favorite attraction the whole trip just for the fact of being able to hang out in 30 degree temps. And I’m digging these descriptions of Sandusky weather. One of my cousins was particularly worried about being rained out, but I’ll just have to tell him we’ll treat rain situations the same as at any other theme park. Ah thanks for answering my question, regarding parking near Soak City. I had looked at the map of the property on the CP app and just wanted to be certain. The projected wait times you stated for both parks are more along the line of what I’d like to see, and I’m particularly excited to hear about how great the operations are at CP. I definitely want to avoid a situation like Bobbie has had at either park. Ideally I wouldn’t want to wait longer than 90 minutes at the most for anything super popular (Bobbie, I definitely don’t want to be waiting 150 minutes haha), but I probably won’t be able to avoid that with SV (here’s hoping you’re wrong, AJ ha). Right now, the touring strategy is up in the air until my party and I decide on getting the Platinum Pass or not. I know me and one of my cousins are definitely on board with it. As you and Russell have said, it’s kind of a game changer for any planning, and it may even lead to some tweaking of our schedule (like doing the day and a half at KI). As far as Fast Lane Plus goes, we’ll get it for KI more likely than not, especially if we just end up doing one full day. The same cousin who was worried about getting rained out/wants a Platinum Pass has definitely been thinking about situations like yours, Bobbie. It’s probably what he’s worried about the most (he’s actually the one who brought up Fast Lane to begin with). If we did get it for CP, we would just do one day to hit all the coasters a lot, like you said, AJ. AJ, I’ll be sure to let you know if our plans change, and we’re in the parks on the same days as you and the group. Even if they don’t, and we somehow just all run into each other, I’d be down with getting a cup of coffee/drink or whatever. Bobbie, I’m wishing you all kinds of good luck this weekend at KI. I’m sure you’ll have a great visit too, and I would definitely like to hear about it whenever you have the time (whether that means in this thread or another, that’s up to you). This is great information .... thanks guys. I'll be visiting KI for the first time next month, so I'm even more prepared now ... :) I go to Carowinds, KI then CP on a 2 week trip, so looking forward to new parks, new coasters and revisiting CP. I've never been in June, preferring to visit before the water park opens as it always brings more people onto the resort. I always stay at the Breakers as I like to be on-site, and it gets me in an hour early. With all 3 parks being Cedar Fair, I bought the platinum pass as my plan is to visit each park for 3 days, but that also gets you in an hour early so it may be worth considering. Free parking too, and that adds up. It's rare I buy the fast pass with the amount of time I spend in the parks, but if the first 2 days are busy I will always consider getting one. It's good for the Maverick as it drops you right at the gate, but the other FP entrances are only a part way in. Then, if like me, you prefer the front seat, it can still be a long wait. My trip is only 2 weeks away, so really looking forward to it. Weather wise it's a lottery. I take shorts and t-shirts, winter gear and rain gear just to cover all eventualities. The wind off Lake Erie is the killer for CP especially the TTD. Thanks, Mako! It sounds like you have a great trip planned, and I’d definitely like to hear about it afterward. I’m a little jealous you get to spend so much time at all the parks though haha. Have you been to Carowinds before, or will this be your first time there as well? Honestly I wanted to work a third amusement park into my trip too (either starting off in Tennessee at Dollywood or in Indiana at Holiday World), but those plans got nixed. Hey Shane ... first time to Carowinds and KI, and I’m guessing around my 15th-16th trip to Cedar Point. I lived in the Detroit area for 6 years so we would go to CP at least twice a year, once in May and once for the Halloween bash. Even though I’m looking forward to Steel Vengeance I’ll admit I’m most looking forward to Fury 325 at CW. I always go on my own, and spend a leisurely few days just wandering the parks. As long as I get to do the coasters at least once, I’m happy. Although there are always a few I’ll go out of my way to ride many more times ... :). I’ll spend hours and hours just taking photos, and by the time I get home I’ll have hundreds, if not close to a 1000 photos to sort thru. My roller coaster screen saver is a great talking point at work. When I get back the starflyer will be close to opening (6/1) so going to try that out. Not sure about 60mph at 450 ft, but why not !! When it really comes down to it, FastLane Plus acts like insurance. If you get there and things are crowded, you're totally fine. If they aren't, you're still totally fine. The latter was the case for my last Kings Island trip (2015), and I certainly didn't regret it. If you budget it in as part of the total cost of the trip, the sticker shock is a bit less frightening. Plus, the entire point of the trip is to ride coasters, right? So why not guarantee a fantastic experience? Also, FastLane Plus wristbands are limited. On a trip to Cedar Point we decided to "wait and see" if we'd need it, and they were sold out. We had an amazing time, but it was the difference between riding Maverick once and riding it five times as we did on our previous trip. All in all, I think they're 100% worth the money! I love these guys! They all defer to me as the guy with all the Cedar Point answers, then proceed to answer the question better than I ever could! I’ll throw my comments in anyway, probably just to reinforce what they already said. 1)	Cedar Point has weather, often several seasons in the same day. Being out in the middle of Lake Erie, it’s often a few degrees cooler than on the mainland. Rain is certainly possible, so check the weather forecast. If it does rain, it’s usually short-lived. Cedar Point tends to shut everything down if there’s lightning in the vicinity or if it’s raining substantially, but they get things back up and running as soon as possible. It shouldn’t be too hot in June, but throw a sweatshirt in the car just in case. 2)	Cedar Point is so big that it has four gates. The closest gate to Steel Vengeance is the “Resorts” gate, located across from the Cedar Point Shores water park. To get to that gate, get into the far left lane at the parking lot entrance (look for signs for Cedar Point Shores/Breakers Hotel) and take the perimeter road around the peninsula. Caution! There are several stop signs that are a bit unexpected, and pedestrians (especially employees) will NOT look for oncoming cars. As you drive around the far end of Cedar Point, just past Steel Vengeance on your right, look for the signs for Cedar Point Shores parking on your left. If you go straight it will take you to the Breakers Hotel parking, and unless you’re staying there don’t even consider parking there…they get a bit unpleasant if you do. The Resorts gate is still not very close to Steel Vengeance. You have to go all the way through the Gemini Midway and Frontier Town and across the train tracks to get to it. At “rope drop” (which Cedar Point doesn’t have) I can promise that it will be a “running of the bulls” situation towards SV. ETR with a Platinum Pass will help. You can get a Fast Lane Plus at the ticket booth for the price of a regular Fast Lane with your PP, and they sell them starting 15 minutes before ETR opens…OR you can get them for the regular price ahead of time on line. One the local Cedar Point boards lots of locals- more than I have ever heard before- are talking about getting FL+ just for SV. They have had three days of special openings for season pass holders to hopefully shorten the wait time, but still expect and average of 2-3 hours without FL+. The year that Valravn opened the wait even with FL+ was up to ½ hour. How long will it be for SV? I have no idea, but I would suggest you go to the bathroom before getting in line. 3)	How will Steel Vengeance affect the wait time for the rest of the rides/coasters? That’s the $64,000 question. Nobody knows. I suspect that the wait for Maverick will still be long if not longer than normal, but they usually get FL+ through quickly. The rest of the park? I can’t disagree with what anyone else who’s posted in here has said. MF, TTD, Valravn will all have long waits. Gatekeeper is a people eater, and the wait is usually not too bad at all. 4)	Take advantage of some of the Cedar Point rides that are unique to the park. The Sky Ride is one of the last ones still running that doesn’t include a mountain and ski runs, and it gives you amazing views of the original Cedar Point Midway. Remember, though, it’s a one-way ride, so if you want to go back to where you started you have to disembark and go around to ride back. This I’m going to put in all caps because it’s important- DO NOT LEAVE THE PARK WITHOUT RIDING CEDAR DOWNS!! It’s one of the last racing derby rides in the world, and is so much fun! Also, make sure to take a stroll down Frontier Trail- it’s shady, lined with log cabins and has a terrific petting zoo, and for some reason you don’t even notice MF roaring over head. 5)	Cedar Point was not planned as an amusement park. It evolved, and its unique geography caused it to be rather oddly shaped. That being said, the park is huge! Wear comfortable shoes- it’s literally a mile from the front gate to Steel Vengeance. 6)	Last thing- well, not really, but this is already too long- don’t forget to check out the Cedar Point beach. Cedar Point started out as a beach resort, and it’s working hard to bring that part of the resort back to life. They have a Boardwalk that now extends from the front parking lot all the way back to past Cedar Point Shores, and they have a beach party every night with music, bonfires, fireworks, and a mile-long sandy beach, the longest on the lake. Have a great time! Expect to stand in line waiting for the most popular rides, don’t forget to use your Platinum Pass every chance you have for discounts (print out the list from the CP website if you can), try some of the new foods in Frontier Town (they’re really pushing their new bbq and smoked foods, and the loaded Sidewinder Fries are terrific!). Pink’s Hot Dogs are terrific, and a new restaurant last year, Melt, features a huge menu of gourmet grilled cheese. I think their Monte Cristo is better than the one at Blue Bayou in Disneyland. I don’t know if I’ll be able to be there, but when I can I always wear my Theme Park Insider shirt. Look for me! @Mako: Yeah that sounds great! I'm hoping to take a trip over to NC and Virginia in the next couple of years to hit up Carowinds, Kings Dominion, and Busch Gardens Williamsburg. Have you ever done any kind of a trip report for this site? You have to share all those pics with us. You're right though. There's nothing like wandering around a park and soaking in all of the atmosphere. And I forgot about Starflyer opening up in Orlando. I thought it was opening up this month though. I guess it got pushed back. @Clayton: Thanks! And duly noted, man. I think we are all prepared to cough up some extra money for it, so it won't be a problem. Especially considering it even more after what James K said. @James: They have to pay their respects to one of the best. I've seen many a piece by you about Cedar Point on here over the years, so I would be deferring to you too. By the way, I really enjoyed the SV video with you and Robert. Also thanks for the add on FB. I keep on loving what I hear about Cedar Point weather. I know I won't get too cold, but I'll make sure my girlfriend brings something just in case. After what everyone has said, I do plan on using the Resorts gate, and if we have to run to the hills one morning to get to SV, that's a chance I'm willing to take. It won't be the first time. After seeing TPI and CP's ride videos for SV, I'll have to agree with you and AJ about the projected wait times for it. As I said above, I'm leaning more towards getting FLP (especially if we all end up getting Platinum Passes), but I still have some time to make that decision. My girlfriend and I saw Cedar Downs on a video tour of the park, and we're definitely making a point to ride it a few times. The other night, we were eating dinner with some of my family, and my dad was teasing her a little bit about not wanting to ride anything real crazy. He brought up riding a carousel, and we both told him we had to ride the one at CP since it's a racing derby. I actually was going to ask about the beach around Cedar Point. We'll have to go check it out as well. Also thank you for bringing up some food. In one fell swoop, you pretty much picked out my lunchtime meals for me haha. Thanks so much, James! I'll keep a look out for you in case you're around. First and foremost DO NOT go to the back parking lot. Call the park (Cedar Point) to see when the lot opens. I was told on another site that for 2018, that lot will not be open to guests until 10:30. I would park in the main lot and hoof the boardwalk to the resorts gate. Leave yourself a few minutes to check out the main (old) wing of hotel breakers lobby and rotunda. Gate open time is 10, unless you stay at one of their propertiws, then you can get in at 9. FLP..personally I loathe the program. If you can knock off steel vengeance and maverick in the first two hours without it, I would start working my way to the front. If Millenium Force has less than a half hour wait, I would forgo the extra exoense. SV will probably be your only non reride, unless you get in line at the end of the day. Usual traffic flow runs front to back. The vast majority of people will still enter the main gate. 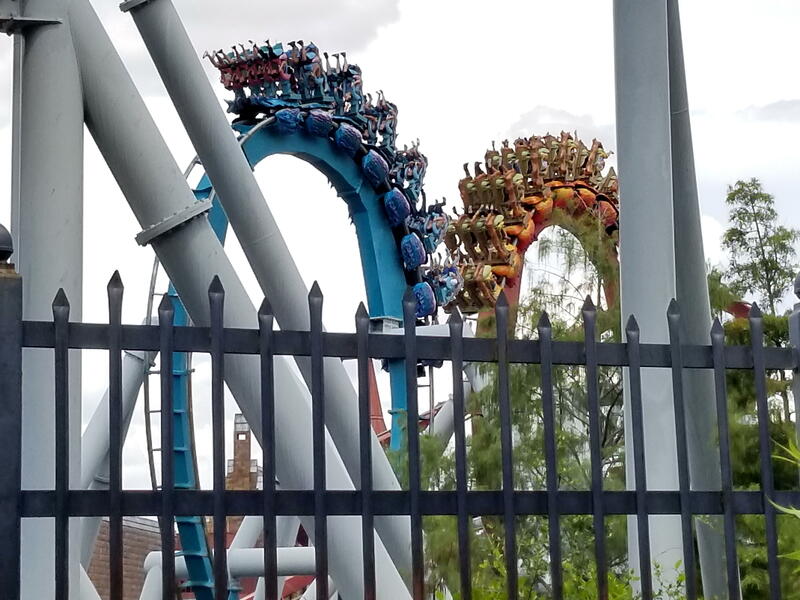 Gatekeeper, Raptor, and Valravn will have early long lines that will dwindle afternoon.non coasters generally have short lines. Weather..wind is your biggest enemy there. It has the potential to shut down a few flats and coasters. Make sure you take that into consideration when checking the forecast. Off days. Check out Jet Express website. There are a few islands out in Erie worth visiting,the JE site should have links for them. I understand there is a carousel museum in Sandusky. Also, if you want to take a road trip, go to the western reserve history museum. A former Cleveland park went under in 1969, but is still loved today. A group found and brought back the carousel to Cleveland and it now operates at the museum.about an hour drive, which will also take you past the Rock Hall and Museum . At cedar point you will find two plaques mentioning that park, Euclid Beach Park. One in front of Breakers on the boardwalk, the other in front of Cedar Downs. And last but not least. About a 20 minute drive west of Sandusky is Johnson's Island . One of the best kept secrets in the area. It operated as a confederate officers pow camp during the civil war. The soldiers cemetery is well kept and you get a great view of CP from the shore. It is an island bit has a causeway. Cedar Point actually had gun replacements near the lighthouse to guard the bay from invasion and to help prevent escapes. Later, near the turn of the century, it started to compete with CP. Oddly, there was a fire one winter.. Thanks for the info, Brian. I had not heard about the CPS parking lot being closed until 10:30. Does kinda make sense. The rest of your suggestions are spot on, except maybe for how long it takes to walk places in Cedar Point. I'm getting older- not quite as much spring in my step! If I hear anything else I'll pass it on here, too. Thanks! Good to know there's another CP local that hangs around TPI. Thanks for the heads up, Brian, about the back parking lot. If it does open up later, it wouldn’t surprise me. I’m pretty much prepared to hoof it over to Maverick (and SV if that situation resolves itself) from whatever gate I have to first thing on one of the CP days. Also thanks for those suggestions for the points of interest. The pow camp sounds very interesting.